When dorm room shopping, you look for the comfiest dorm essentials. You want super soft dorm rugs you can wiggle your toes in, soft, comfy dorm bedding that provides a quality night's sleep and dorm chairs you can curl up in. So why put on boring, thin socks when you want to relax? Our Ikat Dot Dorm Snoozies are a dorm essential cozy foot covering that will provide you with the same comfort and warmth of your dorm bedding! 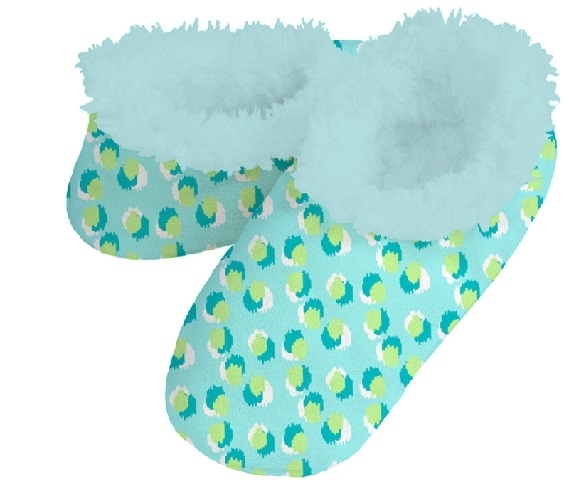 When you get up in the morning or come back from class, slip on your Ikat Dot Dorm Snoozies to fully relax and unwind! Dorm Snoozies are not quite socks and not quite slippers, they are cozy little foot coverings that you will never want to take off! Sadly, you do have to because you have to go to class, but until that time you can relax in style. Made with a brushed fleece exterior and soft Sherpa interior, these are incredibly soft dorm accessories that you will have to feel to believe! Plus with a non-skid sole you won't have to worry about slipping and sliding around your dorm room. Dorm Snoozies are perfect for when you wake up in the morning and don't want to step on the cold dorm floor or for when you just want to relax or hang out with friends in the common room.